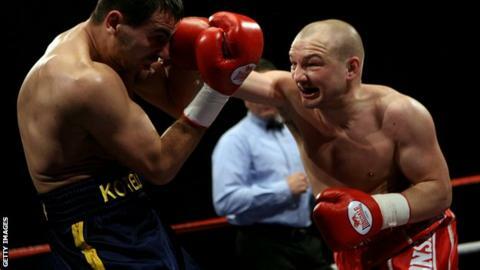 Former world champion Gavin Rees will retire following his rematch with Gary Buckland on 17 May. The former WBA world light-welterweight champion, 33, will end his 16-year career at Cardiff's Motorpoint Arena. "I will leave everything I have in the ring on 17 May and I am proud of everything I have achieved," he said. "My trainer Gary Lockett has done a brilliant job getting me through training camps in the last few years but I can't keep doing it." Rees added: "I've had a fair few injuries and they are catching up with me, but I've still got a great fight left in me and I plan to empty everything left in me out in Cardiff. "Winning a world title was a dream come true and all British fighters want to win the British title so claiming that for the first time in 2010 was a huge honour." Rees, a former British and European champion, secured the WBA world light-welterweight title in 2007 with victory over Souleymane M'baye. He lost his belt to Andriy Kotelnyk in March 2008 but reignited his career by winning the Prizefighter competition the following year. After taking the British and European lightweight titles he was given a shot at becoming a two-weight world champion against then WBC lightweight champion Adrien Broner in February 2013. Rees was outclassed by the American in Atlantic City and suffered defeats to Anthony Crolla and Buckland in his following two fights. Fellow Welshman Buckland claimed a narrow points verdict over Rees in a British lightweight title eliminator in February at Cardiff's Motorpoint Arena. Rees pondered retirement after the loss but decided to carry on and will face the 27-year-old in a rematch. "The first fight was a classic and you couldn't argue with the decision going either way," Rees said. "Of course I thought I did enough to get it but there were no complaints. Gary is a fantastic fighter and you know what you are going to get with us - all-action for 12 rounds. "It'll be an emotional night for me knowing that it's the end of a brilliant road, so I want to bow out in style and say I ended my career with a great win in Cardiff."